Jeremy leading Mississippi Buttress Direct – approaching the Crux – not too sure that second piece of gear is too solid though. Not quite an on-site due to seconding Mike on Mississippi Variant prior. Carl attempting to follow Mike up Barry Manilow VS 5a. 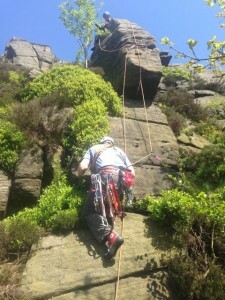 Belay is protected from the rock face behind and a cam next to Mike to stop him being pulled off the side. This entry was posted in IMC Trips on 29/05/2014 by Adam Gosling. And the full results from the 2014 Champions Cup sponsored by Action Outdoors – this year we had a very good turnout with 23 people taking part across the three categories. Competition was tight in the beginners category with Josh & Baz vying for the lead most of the night, with the completion of the bonus route 19 it looked like Aisha had clinched the top spot, but with Josh completing it he topped the group at the end. We had a large field competing within the intermediate group this year, with Rob and Sylwia swapping positions frequently during the night. Interestingly Josh would have been third had he entered the Intermediates (which as he’s won beginners he will be next year). Congratulations to Rob for his victory in Intermediates, which comes two years after his victory in the Beginners category, good look in experts next year! In the early stages of the competition things looked tight in the experts category with Alistair, Tom & Jason trading places, however as the night developed a clear leader emerged. 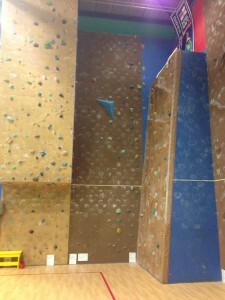 Being the only person who completed routes 1 & 12 Ali secured victory with those two climbs alone. So congratulations to Alistair O’Connell our 2014 IMC Champion. Marc for assisting with the night, including route setting, scoring, belaying, fixing loose holds and retrieving your quickdraws when needed. Guy, Steve, Rob, Martin & Shaun for their assistance in setting the routes. Rob & Hannah for their excellent cakes for the raffle (my office enjoyed demolishing Rob’s cake earlier today) and to everyone else who supplied raffle prizes. And finally to Action Outdoors for kindly agreeing to sponsor the event again this year. 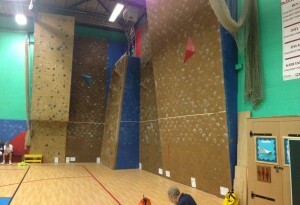 If anyone wishes to have another go at any of the competition routes the route sheets are behind the normal ones on the wall. 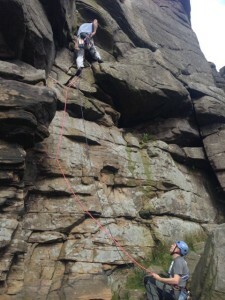 This entry was posted in Indoor climbing on 20/03/2014 by Adam Gosling. Climbing between 7.30 and 9.30. You can register after 7.30 so don’t worry if it’s a rush from work. As we did last year the year the registration and scoring will be computerised, and if we’ve got the magic spreadsheet correct we will even have live scores. 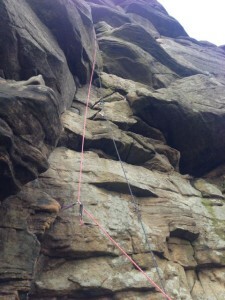 As with previous years there will be a mix of routes from simple to fiendish; this year there will be four lines with a top rope, four that are lead only and making a new entrance is a line with Pink Pointing. 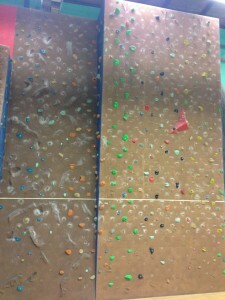 You’ll need your own rope/quickdraws for the lead routes, and your own rope for the Pink Pointed routes, both of these are only open to those entering in the Intermediate or Expert categories. It’s all for fun, a little cash raising for the club with the raffle & entrance fee, there will probably be a cake or two- that sort of thing, so please come along and join in even if you’re not really the competitive type. This year to help the IMC ‘holds fund’ there will be a £2 entrance fee, and of course don’t forget you will need to pay £4.20 to Copleston in the usual way. If you’ve not been for a while then look out for the new purple and black holds purchased jointly between the club and the school. The rules are as per previous years, you get points for any route you complete cleanly, if you weight the rope, fall or need a rest you can try the route again, but you must start from the ground again. But if you can’t do it no hogging the line to keep trying! We will be adding the results and some photos onto the blog after the event. 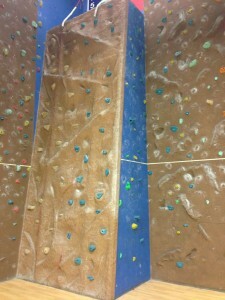 This entry was posted in Indoor climbing on 18/03/2014 by Adam Gosling. Following a busy weekend removing, cleaning (10 loads in the dishwasher) and re-routing there are now a large selection of new routes for you to try out. We have new routes ranging from 3 to 6a+ on the vertical & overhanging walls (Guy is probably working on the 6b). There are Blue & Orange 3s on the vertical wall, a Green 4 on the overhang, Beige & Yellow 5s on the vertical wall and a whole collection of other new challenges. 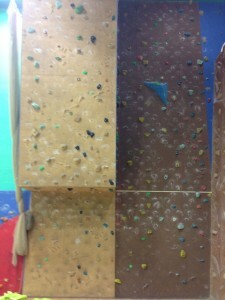 The slab has been updated to have two beginner routes, blue on the right being the simpler of the two. There are two new challenges on the step overhang – Beige at 5+ and a challenging Black. The next-door vertical wall now has challenges from 4(Yellow on the left) to a challenging red involving a lay-back on the slab and for a final bit of fun you could try the mantelshelf route. So enjoy, more routes will follow soon. We hope to get some new holds soon working with Copleston School. The club holds fund is going well, if you wish to contribute please let me know. And finally remember after re-routing holds can spin so take care. This entry was posted in Indoor climbing on 24/11/2013 by Adam Gosling. The big re-routing weekend has started, the walls are now looking rather blank. Features only on six panels for now and four other old routes have gone too, hopefully I’ll finish cleaning the holds and we will get some new routes up tomorrow & Sunday. This entry was posted in Indoor climbing on 22/11/2013 by Adam Gosling.